Celanie: Poems & Drawings after Paul Celan. Poems by Jack Ross, with drawings by Emma Smith and an Afterword by Bronwyn Lloyd. (Auckland: Pania Press, 2012) 168 pp. 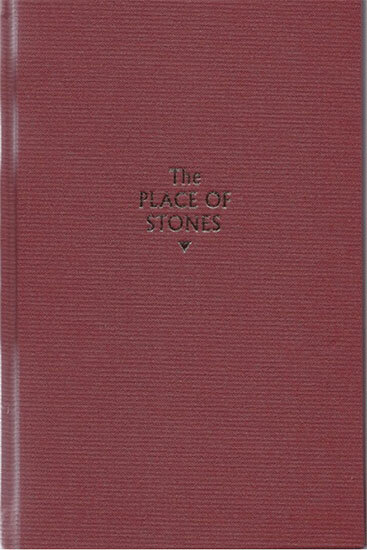 ; The Place of Stones, by Martin Edmond, with photographs by Maggie Hall (Holloway Press, 2013), edition of 70, 62 pages, $275. Creative writing is a celebration, or at the very least a contemplation, of the individual’s unique experience of the inner and outer worlds. Wittgenstein believed that some experiences were ultimately incommunicable, and creative writing seems to me a way of attempting to get around that in a world where telepathy does not exist, even if hermeticism is the result. In 1951 Theodor Adorno famously pronounced that ‘after Auschwitz, to write a poem is barbaric’. If he meant this literally, he was wrong, but never again would a poet write with the blithe Romantic certainty of a Keats or Wordsworth. A number of poets who survived the European Gethsemane of the Second World War certainly seemed to act out this proclamation, destroying and remaking the Muse by writing anti-poetry: Tadeusz Różewicz (born 1921), Elias Petropoulos (1928 –2003), but perhaps none more so than Paul Celan (1920-1970), whose reputation largely hinges on a single poem. Celan was born in Chernivtsi (Cernăuţi or Czernovitz, pick your preferred language in the shifting borders), the capital of Bukovina — formerly of the Austro-Hungarian Empire, but ceded to the Old Kingdom of Romania following the First World War — these days it’s in the Ukraine. Celan belonged to the large German-speaking community there. Both his parents were killed in the Holocaust, and from 1942-4 he was a slave-labourer in work camps. This experience inspired his best known poem, ‘Todesfuge’ (‘Death Fugue’, though strictly speaking ‘todes’ is possessive: Death’s fugue), a love song from Hell. It was a truly twentieth century poem, shattering the cadences and pieties of nineteenth century Romanticism, setting the courtly vision-poem of idealised love against the terribilità of the Dies Irae and the personified death of the Totentanz, the dance of Death. The orchestras play on at Majdanek and Auschwitz. Celan’s work is tightly wrought, innovative, allusive and ambiguous (no small feat in a language so structurally logical), influenced by a milieu richly populated with Romanian surrealists: Gellu Naum (1915-2001), Ilarie Voronca (1903-1946), Gherasim Luca (1913-1994), Paul Păun (1915-1994), and Dolfi Trost (1916-1966). He was awarded the Bremen Prize for German Literature in 1958, and the Georg Büchner Prize in 1960. While anyone can understand the ‘Todesfuge’, his other poetry seems to glissade into the palliative security of obscurity under the pretext of penetrating to the core of reality. The bittersweet ‘Todesfuge’ became a cause célèbre as a new generation of Germans discovered it while ritualising their guilt in the auto-da-fé of the postwar period. Celan loathed the fact that his poem had been adopted as a populist scourge by the flagellants of die Vergangenheitsbewältigung (the past to be overcome). The book Celanie: Poems & Drawings after Paul Celan is a collaboration between academic /poet Jack Ross and artist Emma Smith – images and poems ‘translated’ from poems in the correspondence of Celan to his wife, French artist Gisèle Celan-Lestrange. The word ‘Celanie’ was a coining by Celan for the Parisian neighbourhoods where lived in exile. I must confess that my first reaction to it was ‘why bother?’ Celan has already been widely translated (if one can translate something alien even in its native language) into English by poets as illustrious as John Felstiner, Pierre Joris, Ian Fairle, and Michael Hamburger. But then, Ross’ contributions aren’t translations per se, they are ‘versions’ after. The originals, composed in German and first translated into verbatim prosaic French by Celan, complete with glossaries and contextual notes, are merely the point of departure for Ross’ decade-long project. Ross freely admits in the introduction that his German’s not that great (I am gently reminded of the protagonist of Don DeLillo’s 1985 novel White Noise, a university professor of Hitler Studies who kann nicht sprechen Deutsch). So what we have are more the product of a poet than a translator – new poems that can’t really be relied on too closely to get a real sense of Celan at home in his own language. That is not to say that Ross‘ aren’t good poems – they are, sinuous and elegant – but my mistress’ eyes are nothing like the sun. Why alight on a poet you can’t fully understand the music of in the original? Ross, if anything, seems to make the poems too rigid; an observer imposing a quantum state on an indeterminate particle. Celan’s mystery and multivalence is sometimes lost. At times it becomes clear that Ross’ reliance on what Celan lampshades in his letters is not up to the hypersemiosis of Celan’s allusions. It was probably a mistake, for example, to translate the title of the exquisite poem ‘Matière de Bretagne’ to ‘Matter of Britain’ because you immediately lose the allusion to the body of Arthurian legends in French literature implicit in the literary jargon. I flinch at the substitution of an Irish Gaelic word like ‘gallowglasses’ (from ‘gallóglaigh’, elite, predominantly Norse-Gael mercenaries between the thirteenth and sixteenth centuries) into the poem ‘This’ because it doesn’t seem a very natural substitution. There are few cues in the book to direct the reader to the German originals, and with a poet as difficult as Celan I would have thought some explanatory notes would be mandatory. Celan, for example, frequently uses the bitter almond as a symbol for the Jews because of the custom of eating bitter foods at Passover. Indeed, the Jewishness of the poems probably needs a bit more help to express itself, especially for an audience of New Zealand goyim. Smith’s illustrations — variations on the motif of a horse’s skull — are an exquisite accompaniment. Staying with stones, from poetry to prose writers, and Australasia’s best is New Zealand-born, Sydney-based Martin Edmond, a master of the nuances of psychogeography and the art of creative non-fiction. This thin and gorgeous Holloway Press volume The Place of Stones collects together five new and previously unpublished essays. As Aldous Huxley noted, ‘the essay is a literary device for saying almost everything about almost anything,’ which is why it makes an ideal medium for Edmond. His inventive flow of thought and association is reminiscent of W G Sebald, Iain Sinclair, Peter Ackroyd, and Will Self and hint at an erudition that, if perhaps not consistently profound, is certainly wide-ranging, propelled by Edmond’s idiosyncratic interests, curiosity and diverse life experiences. The word ‘essay’ derives from the French infinitive essayer, ‘to attempt’, in this case an attempt to form a coherent synthesis out of a free association of ideas inspired by a single topic. Randomly picked up stones. These deft essays are very much like stones, crystalline, cool, defined, resilient and lasting, something to be kept in your pocket to be rolled around in your palm at meditative moments — which is clearly what Edmond uses them for. Edmond is the sort of writer that makes you feel smarter, more creative and more civilised simply for having read him. His use of language is intoxicating. His mind moves in mysterious ways, but like the most generous of travel guides, he takes us along for the ride and we never get lost, even at the stranger turnings, fluid and supple as an eel. The essays are accompanied by nine exquisitely coloured, beautifully composed lapidary photographs by Australian Maggie Hall. It’s marvellous. At an edition of only seventy elegantly hand-printed and hand-bound copies, one needs to be in quick. ANDREW PAUL WOOD is a Christchurch-based writer, reviewer, critic and translator who contributes to a wide range of publications.